After stories appeared in USA Today and The Huffington Post about the Image Comics/Shadowline comic PETER PANZERFAUST, many more people discovered what dedicated readers already knew: The World War II take on J.M. Barrie’s Peter Pan by Kurtis J. Wiebe (GREEN WAKE, DEBRIS) and Tyler Jenkins is heartfelt, exciting, and well worth reading every month. Now PETER PANZERFAUST #8, which marks the first appearance of the series’ Captain Hook — Kapitan Haken, is receiving a second printing after selling out. The second printing (DEC128222), featuring a new cover by Jenkins, will be in stores on February 27, 2013. It can be pre-ordered from comic book stores until February 4. In PETER PANZERFAUST, Peter, the Lost Boys, and Wendy are members of the French Resistance, seeking to undermine the Nazi invasion. Throughout the series, Peter has been joined by the analogs for iconic Peter Pan characters, including the dog Nana and the brave resistance fighter Tiger Lily. Haken’s appearance on the scene — with hook hand and all — marks a turning point in the series and of Peter’s character arc. 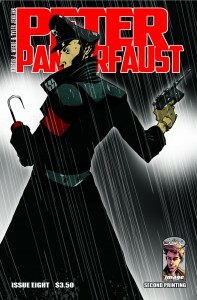 PETER PANZERFAUST #9 will be in stores on February 13. A trade paperback collection of the first five issues of the series, PETER PANZERFAUST: Volume One: THE GREAT ESCAPE is available now, and the second volume, HOOKED, collecting issues #6 -10, will be in stores in March. This entry was posted in Columns and tagged alternative comics, debris, green wake, hooked, huffington post, IMAGE COMICS, indie comics, nazi invasion, peter pan, Peter Panzerfaust, shadowline, tyler jenkins. Bookmark the permalink. Follow any comments here with the RSS feed for this post. Post a comment or leave a trackback: Trackback URL.